Event chair, Phil Sellers, greeted visitors during the Mass MoCA reception. 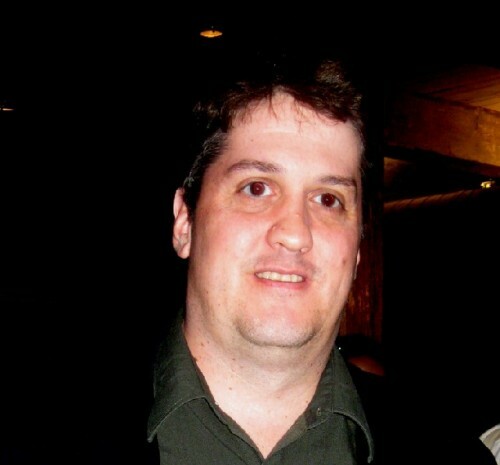 Giuliano photos. City Council candidate, Keith Bona, did all the graphic design pro bono. 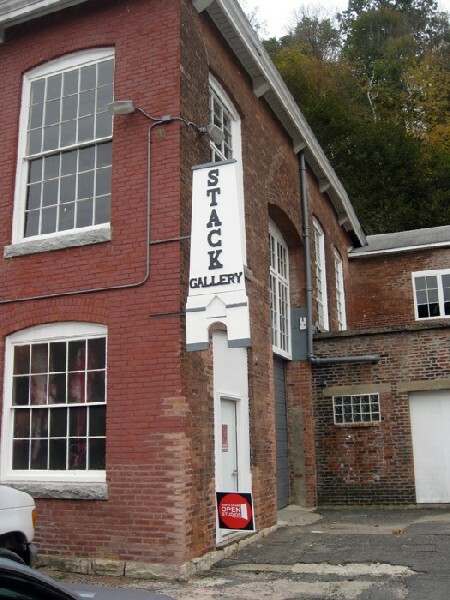 Entrance to the Stack Gallery of NoAMA. An installation of the large poured paintings on plexi by Jean Noel Chazelle. Collaborative paintings by the young artist Andrew J. Schlesinger. Temporary booths were erected in NoAMA. Wilma Rifkin showed her graphic work. 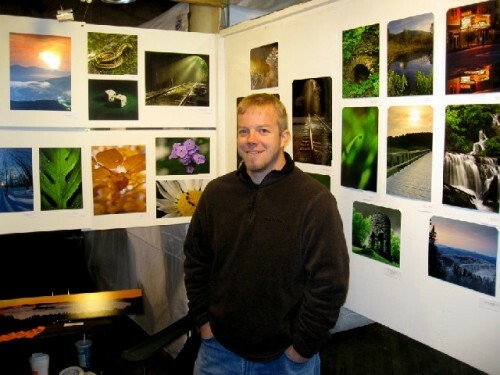 A display of photographs by Dan Morgan. Ed and Sharon Carson she is a former chair of Open Studios. 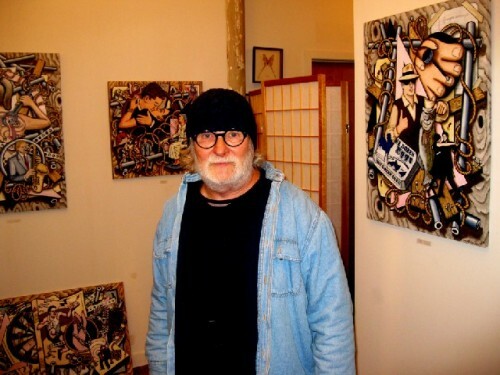 Kelly Lee displayed paintings, photograph and a book he co published with Eric Rudd. Artist David Lane, right, with actors from Main Street Stage who performed in the Eclipse Gallery. A new sculpture by Marjorie Minkin. Debi Pendell reported strong sales. The artist Jennifer Huberdeau moonlights as a reporter for the North Adams Transcript. 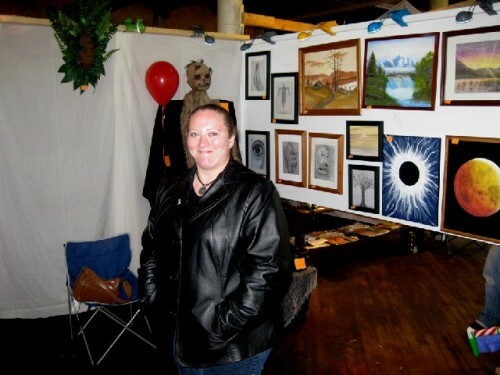 Amy Brassard in her NoAMA booth. 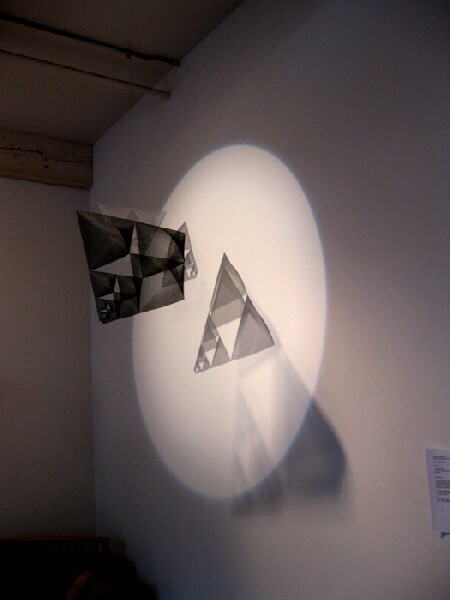 Light sculptures by Richard Harrington were shown in David Lane’s studio. 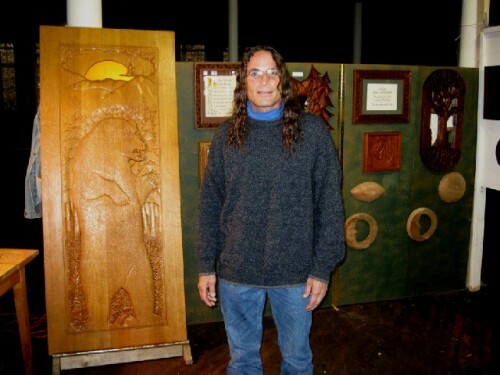 Wes Pecor is a wood carver. There is always humor in the work of Norm Thomas. A display at River Hill Pottery in the Eclipse Mill. J. Williams, left, and a friend were bundled up at NoAMA. Overall the weather was cold and nasty during the annual North Adams Open Studios, a city wide event that was held this past weekend, October 17 and 18. During a discussion with the event's chair, Phil Sellers, who with his wife Gail operates the River Hill Pottery in the Eclipse Mill, he stated that attendance was down by 40% from last year but sales had markedly increased. The city wide attendance in 22 locations may have reached 1,000 visitors during the event. "We had more sales on Saturday than we had over two days last year" Sellers commented. While tired from the busy weekend, which followed a year of planning, he was upbeat. The chairperson and committees have generally burned out after one term over the past five years but Sellers is sanguine for the coming year. "I don't feel that I want to walk away" he said. "I'm not burned out. I want to move forward. We have made some very good contacts. There are a number of people who have indicated that they want to be involved. And individuals who have participated in the past are interested in coming back to help out with specific tasks." 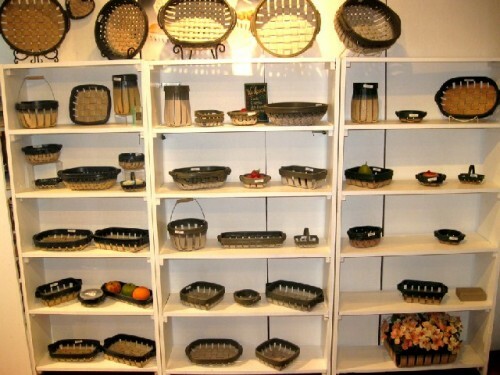 During the summer the Sellers participate in about seven shows and fairs. He talked about the rain that prevailed and put a damper on events. "You plan and organize but never know" he said. "But when there is bad weather the people who show up are serious and looking to buy." This is how he described the mood that prevailed this past weekend. Many of the artists he talked with reported smaller attendances; but opprtunities to interact with visitors and clients in a more meaningful manner. This resulted in stronger sales than occur when the studio is mobbed and artists are overwhelmed. There were also reports of good contacts that promise to pay off in the long term. We asked Phil if perhaps the novelty has worn off. 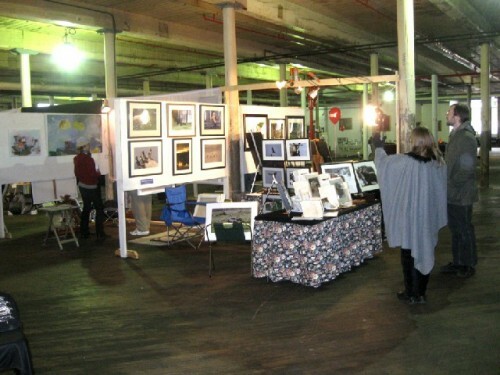 In the first events many local people turned out to see the artists' loft spaces. There was a curiosity factor for many who recall when they and their families, for generations, worked in the Eclipse, Beaver, Windsor and Delftree Mills. They are fascinated to see how these industrial spaces have been transformed into live in lofts and studios. "Not really" Sellers commented. "Most of the people who visited were local. They have been coming back year after year. There were visitors from out of town who showed up wearing Mass MoCA stickers. 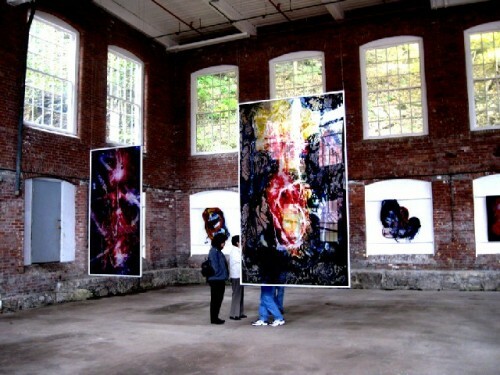 We also had reports of individuals who visited Open Studios but told us they had never heard of Mass MoCA. There were free passes to Mass MoCA over the weekend." On Friday night, as Astrid and I were preparing to depart for the Mass MoCA reception a couple of visitors walked into our Eclipse studio. They had arrived a day early. It turned out that they now live in San Diego but he commented on growing up in North Adams. The family moved when he was nine years old. On Saturday, we ran into a Boston artist. 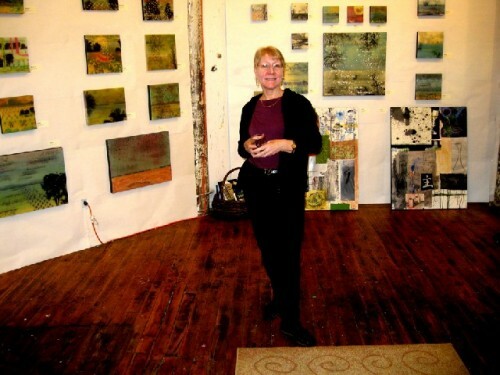 She had e mailed for advice on what was going on and we recommended Open Studios. These were typical of many interactions during the event. 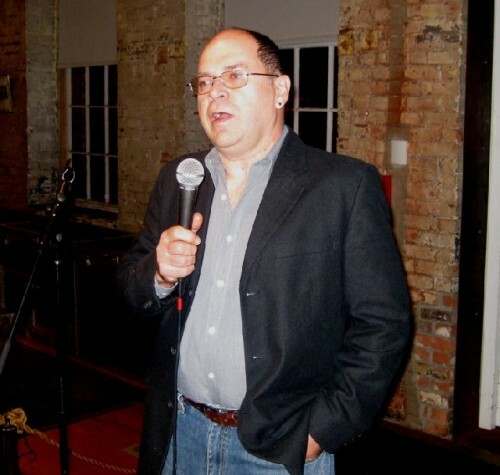 During the current Mayoral race between incumbent John Barrett and contender, Rick Alcombright, there have been comments on the role of the arts in the creative economy of the former factory town. These individual contacts between artists and visitors, local residents, and tourists are a key aspect of marketing the city as a viable, richly diverse destination. 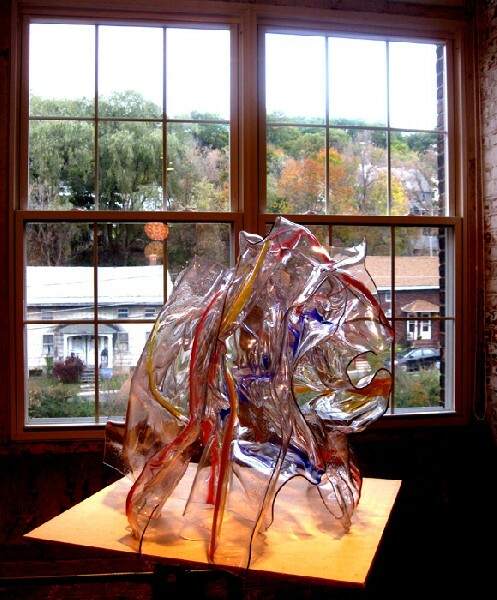 North Adams Open Studios, and the season long Down Street project, or local work hung in the North Adams General Hospital, make the important point that there is a whole lot more going on than just Mass MoCA. The politicians and long time residents of the city have often been slow or resistant to connect the dots. Not all of the final figures are in but Sellers reported preliminary attendance. The Eclipse Mill had about 500 for the weekend with Saturday, at 280, the better of the two days. Across the street at the former Delftree, now North Adams Museum of Art (NoAMA), there were 230 visitors on Saturday and reports of steady sales. In the downtown there was traffic on Saturday but Sunday was slow. 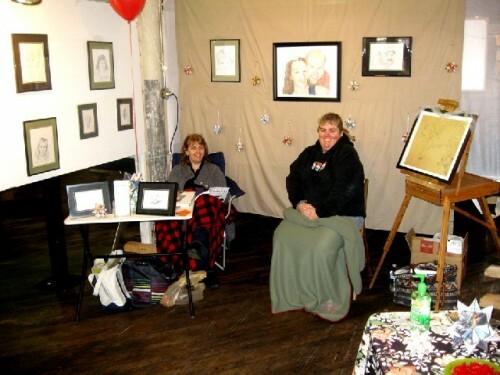 Gallery 51 counted 250 visitors on Saturday. There was no head count available for the Beaver Mill. Depending on whom you talk to Open Studios is Five years old or perhaps Six. 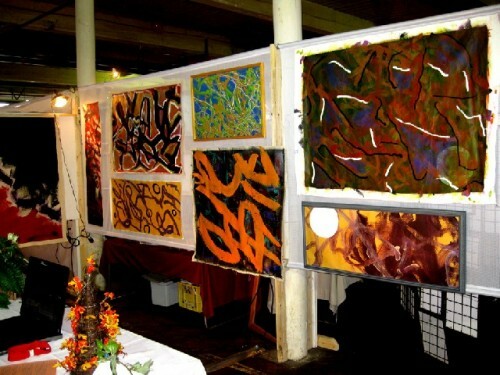 In 2004 there was an ersatz event when several studios in the Eclipse Mill were open for weekends in the Fall and Spring. In 2005 it became a more official event for the Eclipse Mill organized by the ceramics artist, Diane Sullivan. 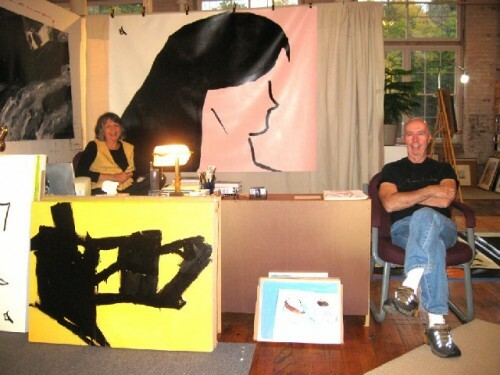 Video artist and antiques dealer, Jane Hudson, chaired, in 2006 when it expanded to city wide as North Adams Open Studio. 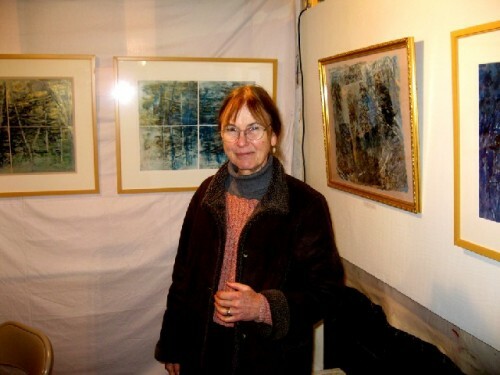 The Eclipse artist, Sharon Carson, organized the 2007 event. 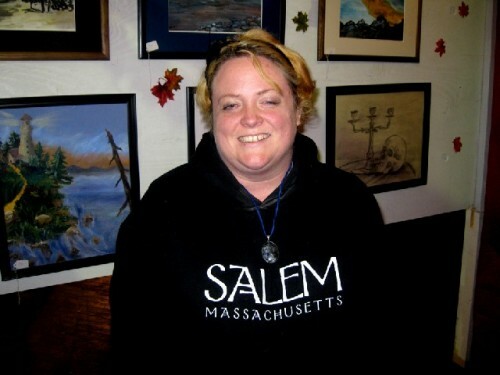 She is now the curator for the North Adams Regional Hospital which was a participant in this year's Open Studios. Last year web designer, Jason Morin, co chaired with Jessica Conzo, an arts administrator for MCLA. As the event has grown it has also become more diffused. There is a lot to absorb if one hopes to visit every downtown venue and all of the lofts in the four mills. In evaluating attendance figures it is difficult to determine whether the 250 who visited Gallery 51 downtown, on Saturday, were the same individuals who moved on to NoAMA and the Eclipse Mill. We asked Sellers how many artists had participated. Overall, he estimated that 180 artists and craft persons showed their work. Of these only 81 artists actually registered and paid the fee that averaged $40. There were discounts for early registration. It is problematic that some venues, which represents a number of artists, pay the same fee as an individual artist. Sellers commented that several but not all of the Coop artists were registered. 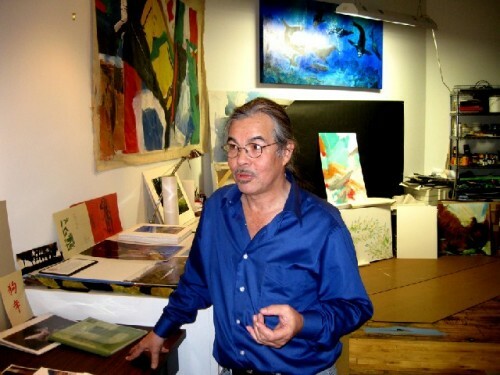 The owner of NoAMA, Ariel Sutain, has been most generous the past two years in allowing the vast, raw space to be used for Open Studios. But there is considerable time and labor involved in constructing and painting the booths. In addition to registration there was a modest surcharge of $15 for the booth rental. Because of a glitch a group of commercial exhibitors paid no fee. They had prior arrangements with Sutain to show their work during the summer and assumed that this carried over to Open Studios. These are issues that hopefully will be resolved next year. It is difficult to prevent artists from opening the door to their studio or displaying materials in the corridors even if they have not paid to participate. Given the pro bono approach of the organizers it is frustrating not to have more artists register and work on aspects of the annual event. In general, artists could do a better job of participating in efforts to promote their work. Because so much effort is shouldered by too few individuals there is the predictable result of burnout. The next group is left reinventing the wheel. There need to be templates, funding, and organizational structures that carry over. This makes it more feasible for the next team to step in and execute clearly defined roles and tasks. Although all the bills have not been paid Sellers is optimistic that there will be a balance of some $1,500 toward next year's budget. This year the committee took in about $3,000 in contributions from sponsors. The largest contributors have been Hoosac Bank and Porches at $500 each. Sellers added that there have been thousands of dollars through in kind services and donations. In that sense Sutain has been the most significant donor through the generous use of his space. Keith Bona did the graphic design and Jason Morin managed the web site. Food was donated to the Mass MoCA reception by Spice Root and Lickety Split. Overall there were 41 sponsors. Some $3,000 to $4,000 was spent on marketing and advertising. Brochures were printed with a map of all of the venues as well as a list of registered artists. While we didn't get to every venue or studio the event provided a dense overview of what is being created in our community. It was an occasion to interact with new artists as well as see the latest work of many friends and neighbors. We share in the enthusiasm of Sellers and his plans for the future. Let's just hope that more individuals get off their butts and lend a helping hand. It takes a village. Link to I Berkshires coverage. Link to North Adams Transcript coverage.